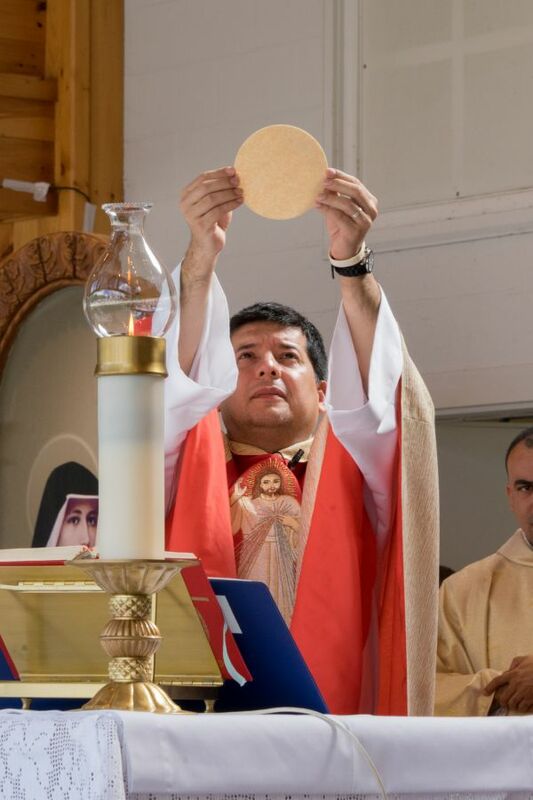 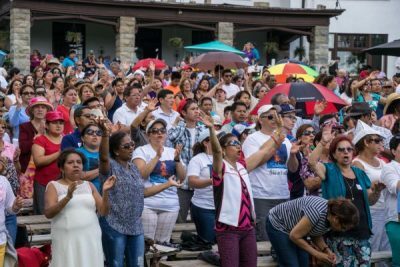 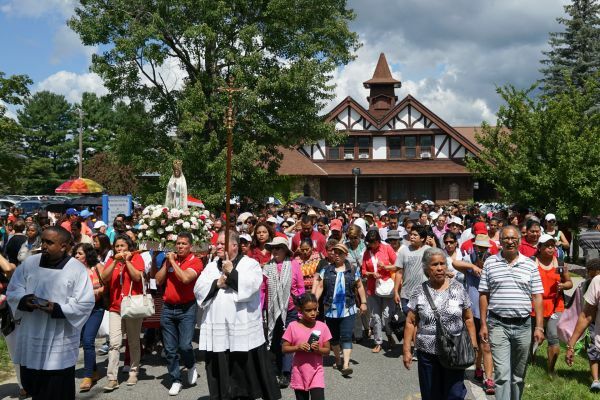 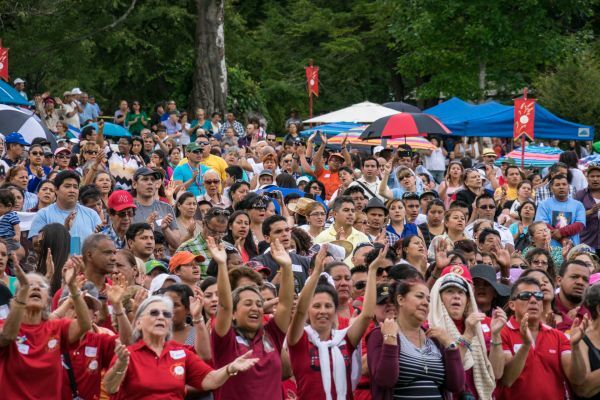 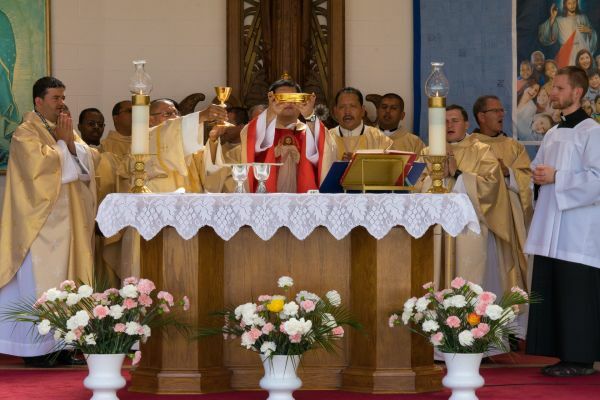 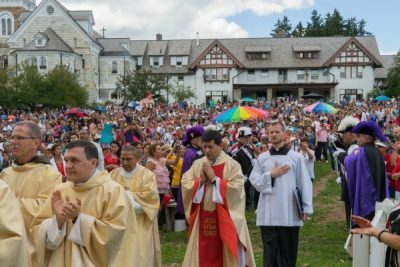 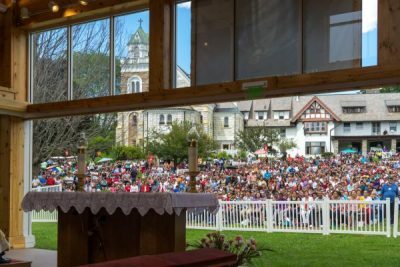 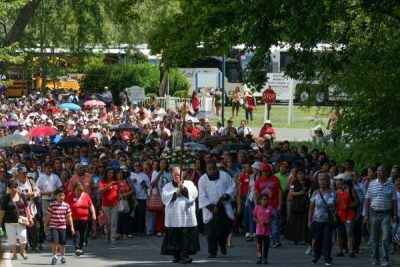 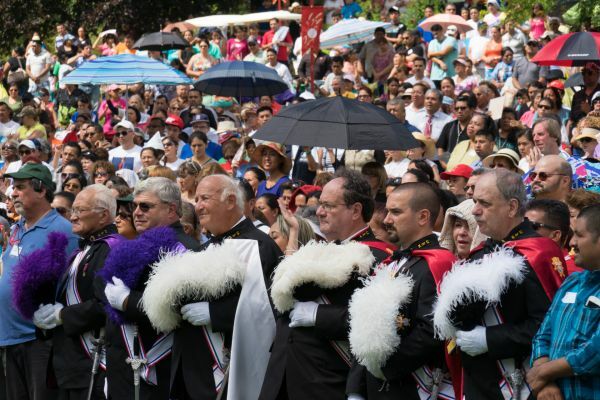 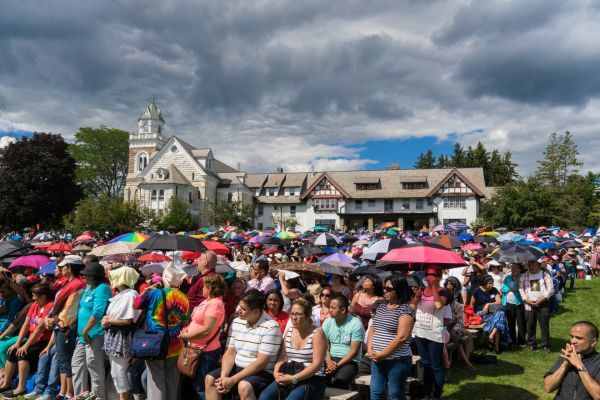 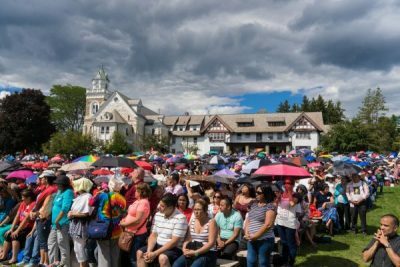 When more than 5,000 Latino pilgrims came to the National Shrine of The Divine Mercy on Aug. 8 for the annual Encuentro Latino, they encountered a blessed opportunity to gain a renewed sense of trust in God. 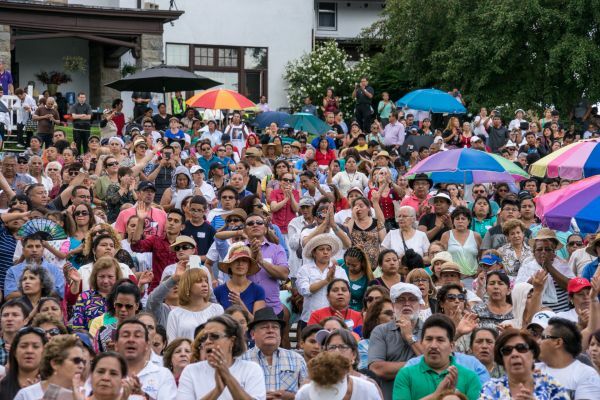 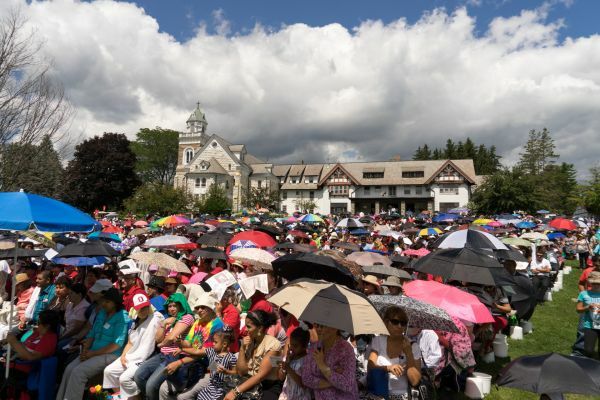 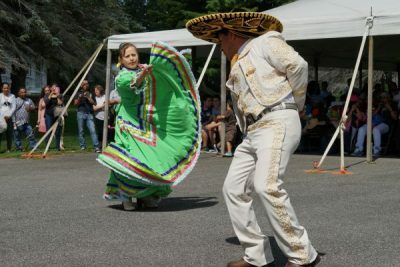 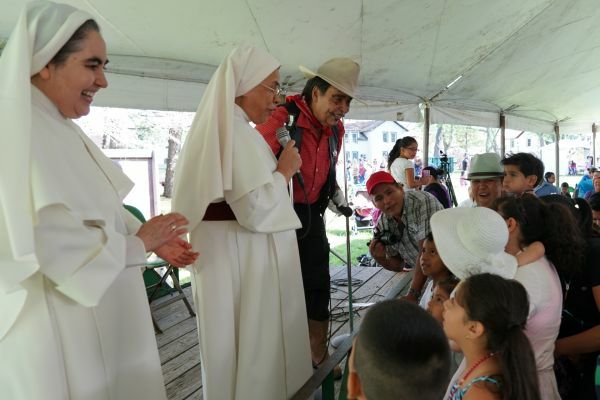 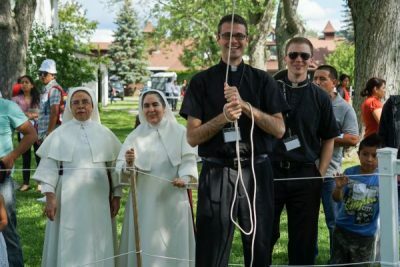 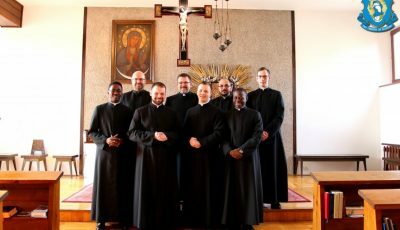 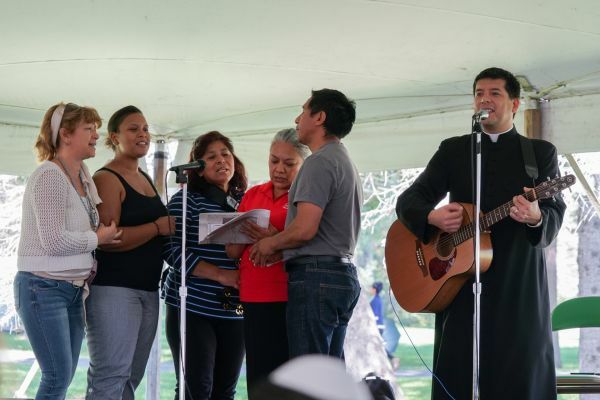 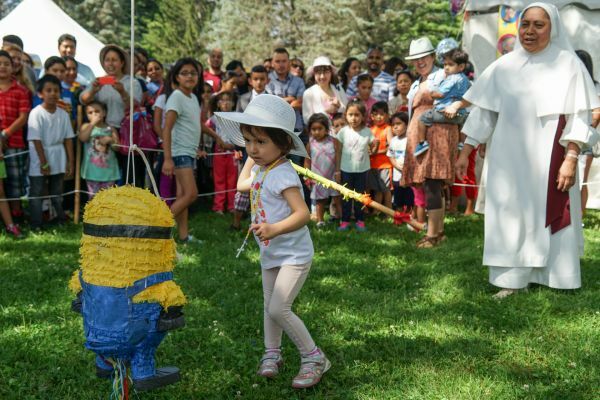 The pilgrims, some of who drove all the way from California, were there to celebrate their culture and love for God and the Blessed Mother through music, activities, and prayer. 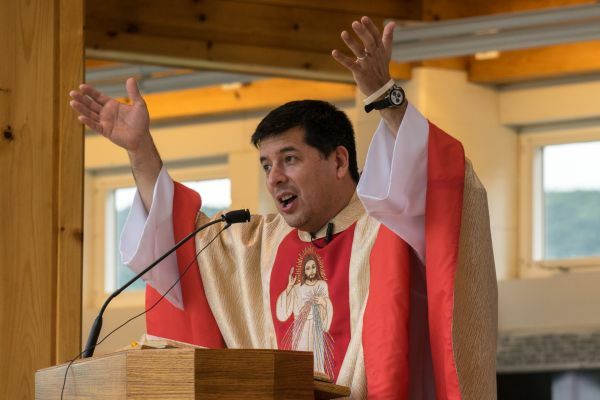 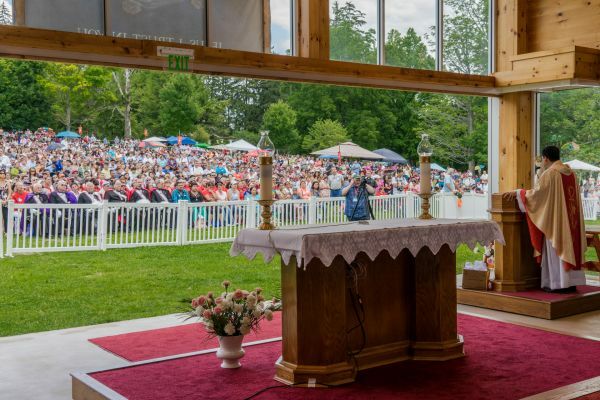 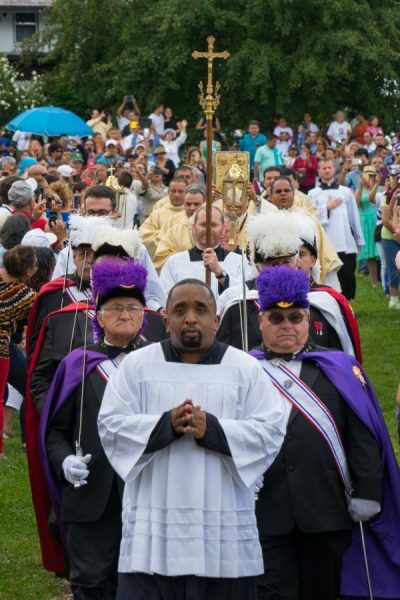 Father Dante Aguero, MIC, was the main celebrant of the 1:30 p.m. Spanish liturgy at the Mother of Mercy Outdoor Shrine on the south lawn of Eden Hill. 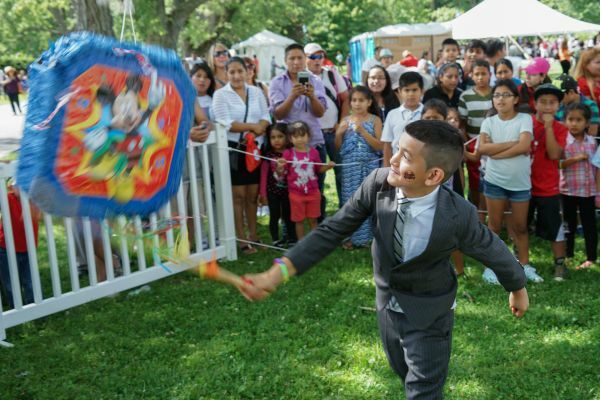 He serves in the Marian mission at Santa Fe, Argentina, and he said this is his third year being the main celebrant of Encuentro Latino. 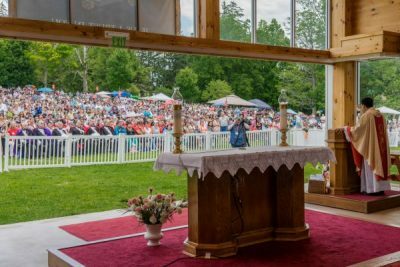 The Mass was lively. Umbrellas dotted the lawn like poppies as pilgrims shared their shade with friend and stranger alike. 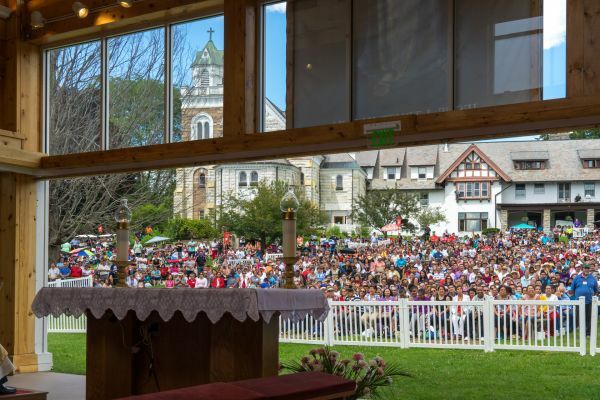 Throughout the Mass, pilgrims young and old sang hymns they knew by heart and laughed at Fr. 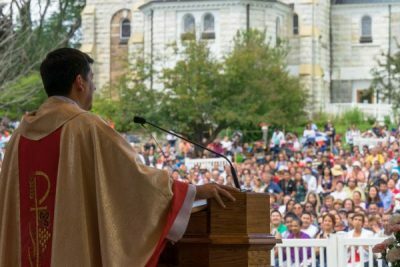 Dante’s sermon. 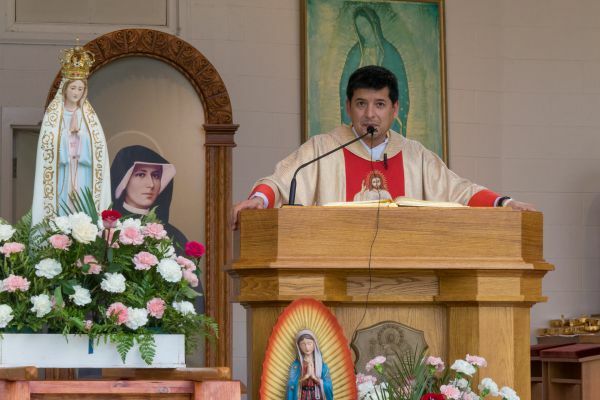 Father Dante said he brought Latino culture into the Mass with his sense of humor. 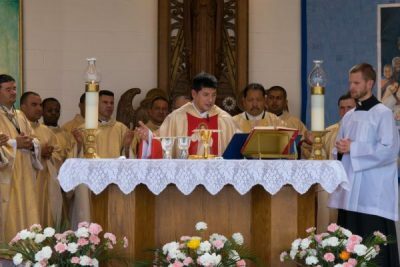 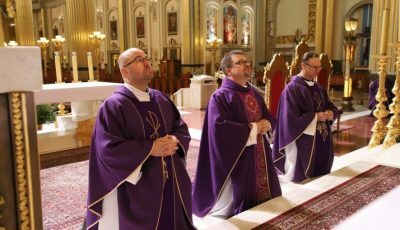 Father Dante said his homilies are rarely completely written before Mass. 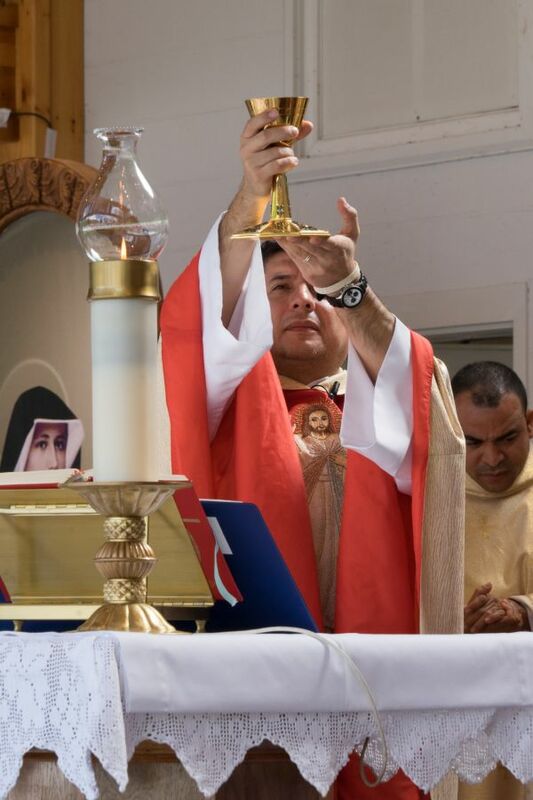 He usually starts with one idea and allows the Holy Spirit to guide him. The idea he settled on for this year’s Encuentro Latino Mass can be summed up in one word: trust. He went on to explain that Mary trusted God even though her life could have been in danger when the angel of the Lord asked her to be the Mother of God. 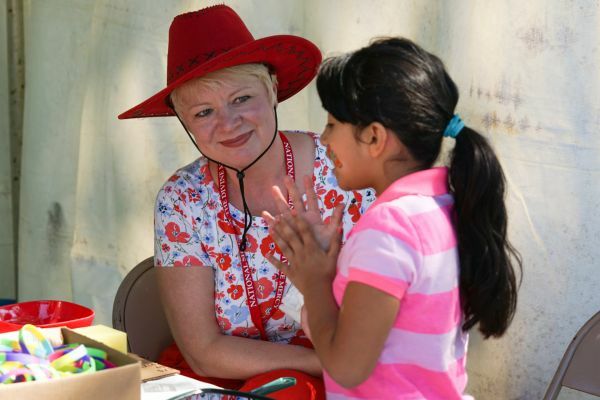 The day’s guest speaker, Dr. Gloria Polo, also gave the pilgrims a lesson in trust. 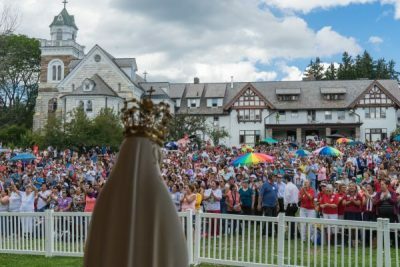 At 12:30 p.m., she began a testimony about how she nearly died, encountered God, and was judged for her mortal sin. 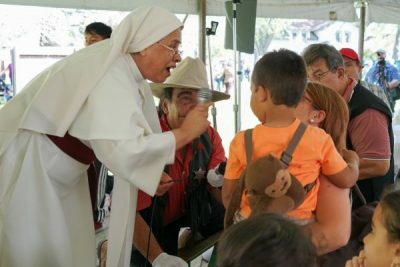 She was given a second chance in life so she could tell her story “a thousand times a thousand” times and bear witness to Jesus’ mercy. 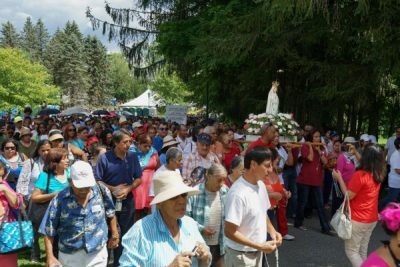 On a storm-tossed May night in 1995, Gloria was walking with her nephew toward the Orthodontist Facility at University of Bologna in Colombia to pick up books. Clutching an umbrella, she and her nephew were leaping over a giant puddle when a bolt of lightning struck them both to the ground. The lightening entered through Gloria’s arm and exited through her leg. 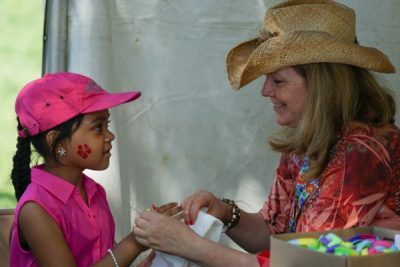 Her nephew died. She suffered cardiac arrest, and most of her organs were completely charred. 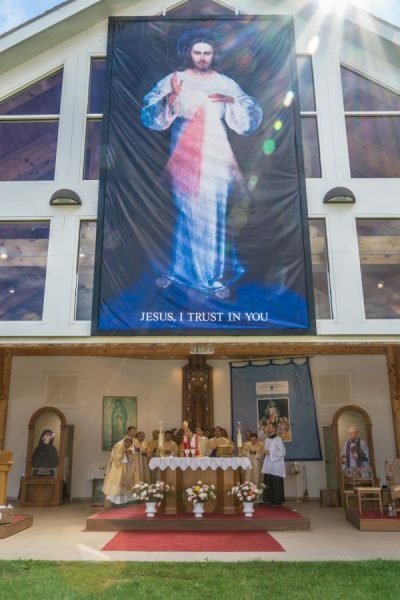 The doctors determined that to put her on life support would be to hope too much, but her sister intervened. 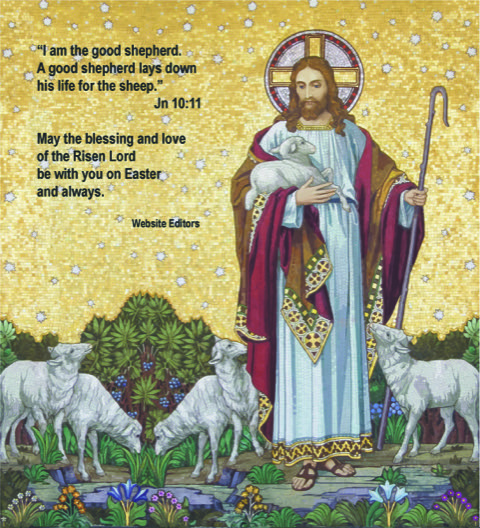 When she was unconscious, Gloria was shown her sins before being allowed by God to return to her body. 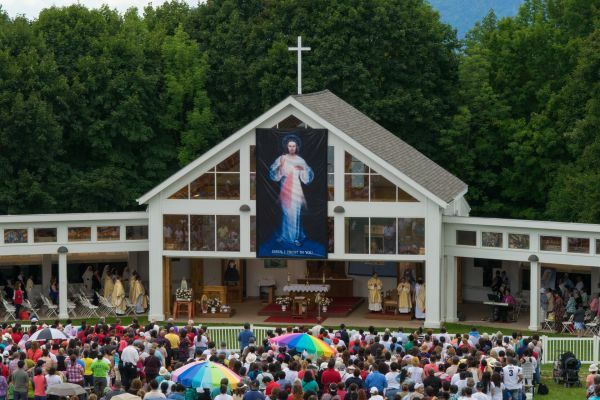 She learned she was vain and she didn’t put her love for God before all else. 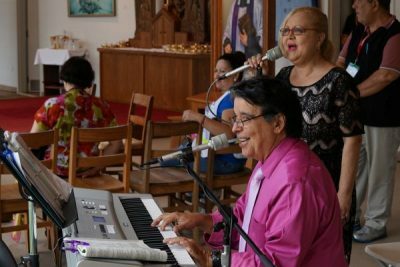 When she woke up, her severe injuries healed: She could walk, her organs were functional, and she was even able to give birth a few years later to her daughter, Maria Jose. Since she was given a chance to heal her soul, she bears witness to God’s divine mercy. 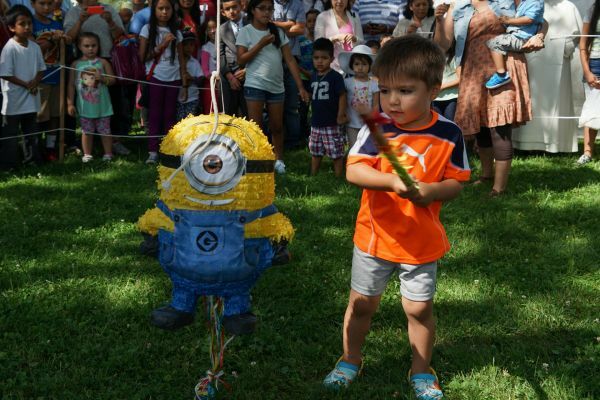 Tomas and Dolores Gonzalos, members of St. Anthony’s Church of Northvale, New Jersey, came to the Shrine for the Encuentro Latino for their second year in a row with their two children, Noela and Raphael. 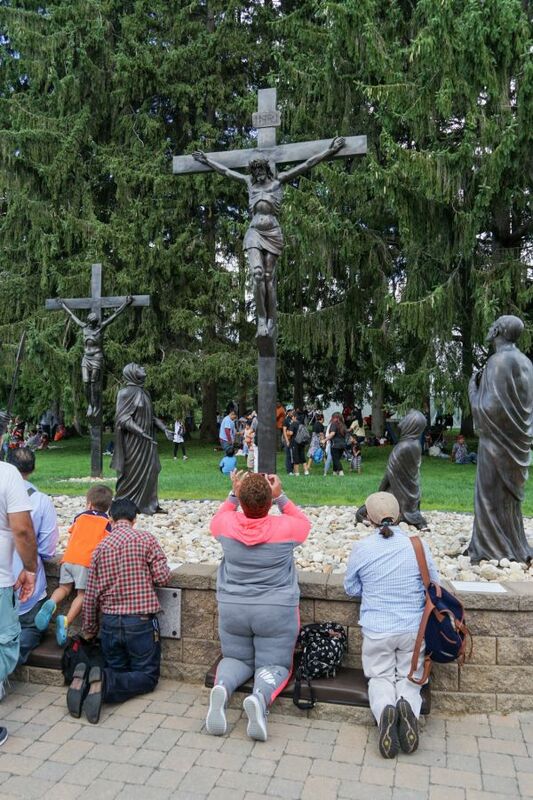 After the procession of the Rosary that they participated in as a family, Dolores was showing her son how to pray the Stations of the Cross using the outdoor Stations on the Shrine lawn. 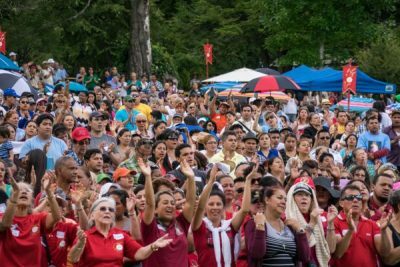 Tomas said they chose to come back because the event rejuvenates their faith and brings them closer to both Jesus and Mary as a family. 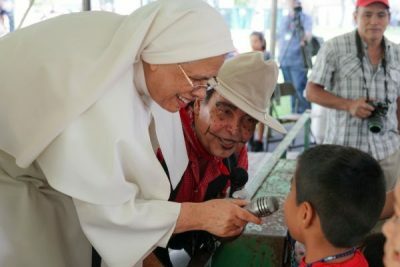 The family heard Polo’s testimony, and Tomas and Dolores said they believed it, especially since God has helped them in their own lives. 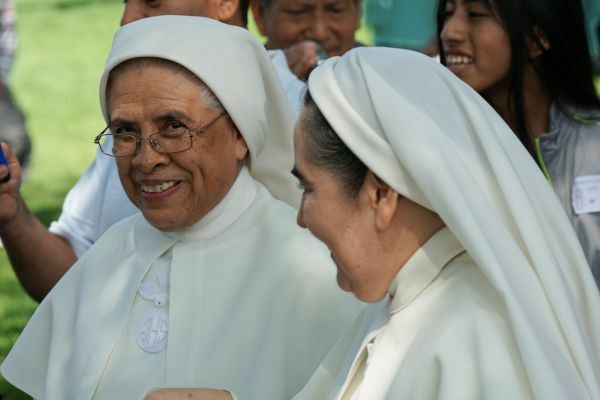 “With God, everything is possible,” Dolores said.